Red chalk over faint lines in black chalk; 29 x 26.5; laid down; wm?. Inscribed in ink at the lower right: 11. The drawing is slightly rubbed in places but still looks remarkably fresh. The paper is stained and is creased about a fourth of its height from the bottom; there is a pin hole in the very center surrounded by other pin pricks and another pin hole about 2.5 cm. above the center possiby related to the making of the copy (see below). PROVENANCE: Vasari (see below). Saint-Morys (see below). Wyatt, 1859, 349, referred to Vasari’s passage. Berenson, 1903, no. 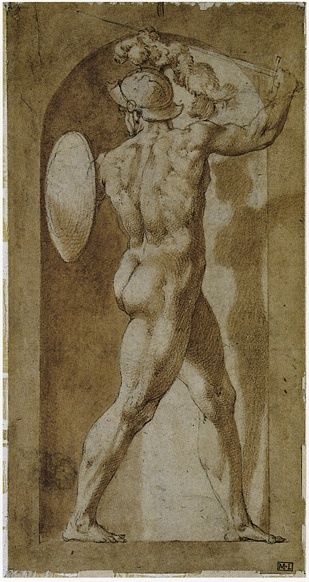 2453, as Rosso and probably the drawing mentioned by Vasari. Voss, 1920, 188-189, as Rosso, and done in Arezzo. Voss, 1928, 45, no. 7, as Rosso around 1529, for a confraternity in Arezzo, as formerly owned by Vasari, and mistakenly as now in the Uffizi. Kusenberg, 1931, 34-35, 137, 145, no. 70, Pl. XXV, as Rosso, 1528-1530, as for the Fraternita in Arezzo, and formerly owned by Vasari; Kusenberg thought a later hand had added some lines in black chalk. Kurz, 1937, as Rosso, and referring to Berenson’s belief that it is the drawing that was in Vasari’s Libro de’disegni. Berenson, 1938, I, 323, II, no. 2453, as Rosso. 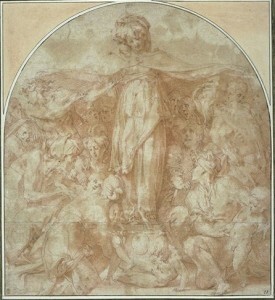 Becherucci, 1944, 30-31 (1949, 31), as Rosso, and done in Arezzo for the Fraternita dei Laici; she also said that in color the image might have achieved the evanescence of Barocci. Barocchi, Commentari, 1950, 159, as Rosso. 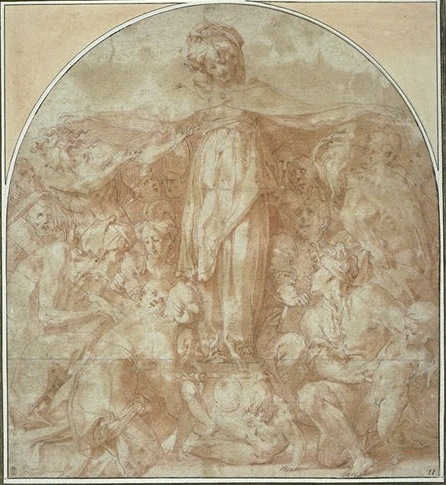 Barocchi, 1950, 73-74, as Rosso, and made in Arezzo for the chapel of the Fraternita; she recognized the influence of Sarto, Michelangelo, and Dürer, and commented on the almost Barocci-like coloristic quality of the drawing. Barocchi believed the contours had been retouched. Adhémar, 1954, 126 (1955, xii, 122-123), and Pl. 17 that reproduces the copy also in the Louvre (see below); as Rosso at the end of 1529 and as made for the Fraternita in Arezzo. 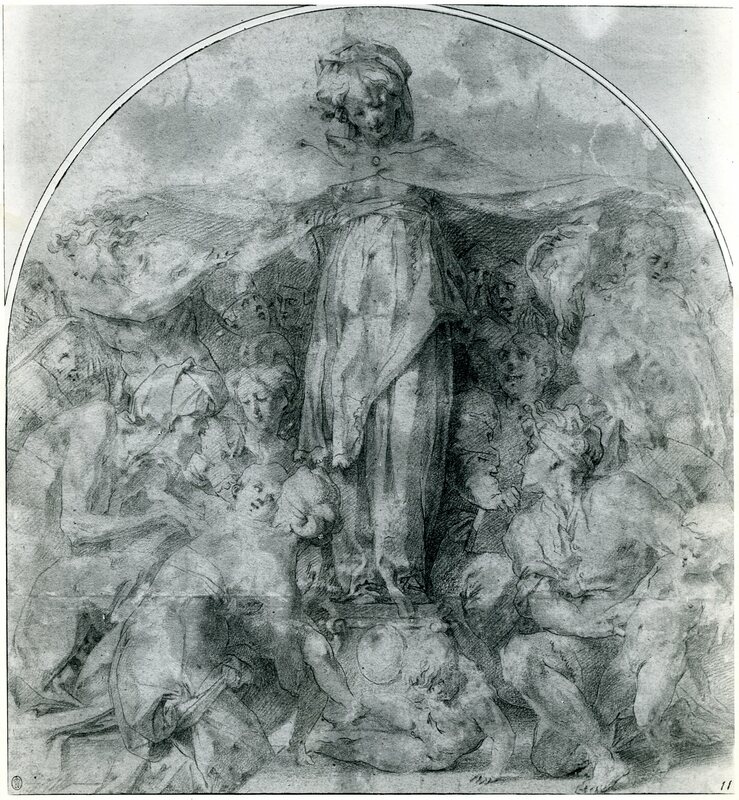 Adhémar said that Rosso brought the drawing to France, and that there are numerous copies of the drawing, including two in the Louvre [although I know of only one copy, the one in the Louvre, on which see below]. Berenson, 1961, I, 471, II, no. 2453, as Rosso. Carroll, 1961, 446, as Rosso, around 1529. Carroll, 1964 (1976), I, Bk. I, 200-204, 207, 209, II, Bk. II, 309-312, D.31, Bk. III, Fig. 89. Carroll, 1967, 304, as used by Vasari for his Madonna del Rosario in S. Maria Novella, which contains a portrait of Rosso, and possibly also by Lappoli for his Immaculata with Saints in the Museo Civico in Montepulciano. Françoise Viatte, in Roseline Bacou, Dessins du Louvre, école italienne, Paris, 1968, no. 42, as Rosso, and done in Arezzo for the Fraternita; also that the contours have been re-worked by a later hand in black chalk. Ragghianti Collobi, 1974, I, 117, II, 197, Fig. 367, as Rosso, and from Vasari’s Libro. 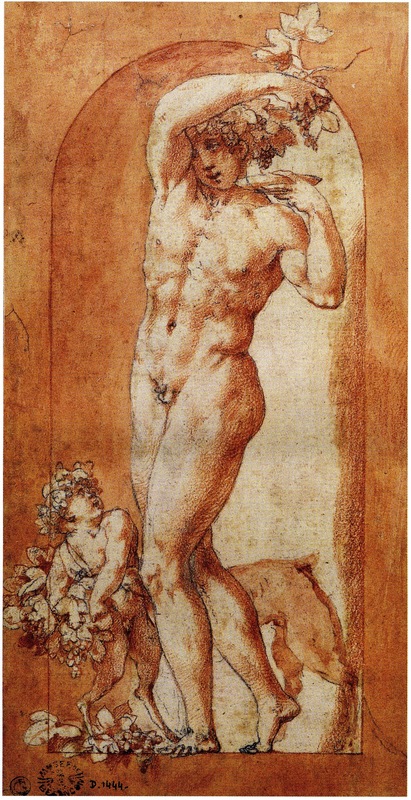 Béguin, 1976, 77, as Rosso, around 1529, and the drawing mentioned by Vasari. Hall, 1979, 62, 116, Pl. 34, as Rosso, and used by Vasari for his Madonna della Misericordia. Mercantini, 1980, 14, 19, n. 28, 31, ns. 64, 65, as by Rosso for the Fraternita in Arezzo. Charles Davis, in Giorgio Vasari, 1981, 272-273, no. 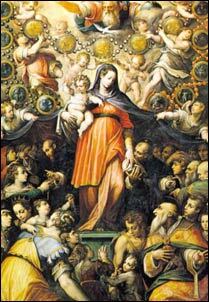 31, who pointed out its influence on Vasari’s Madonna del Rosario, executed with Jacopo Zucchi. Darragon, 1983, 51-52, 58, 60, Fig. 33, as Rosso, 1528-1529. Saint-Morys, 1987, I, 149, no. 71, 224, Fig., as Rosso, II, inv. no. 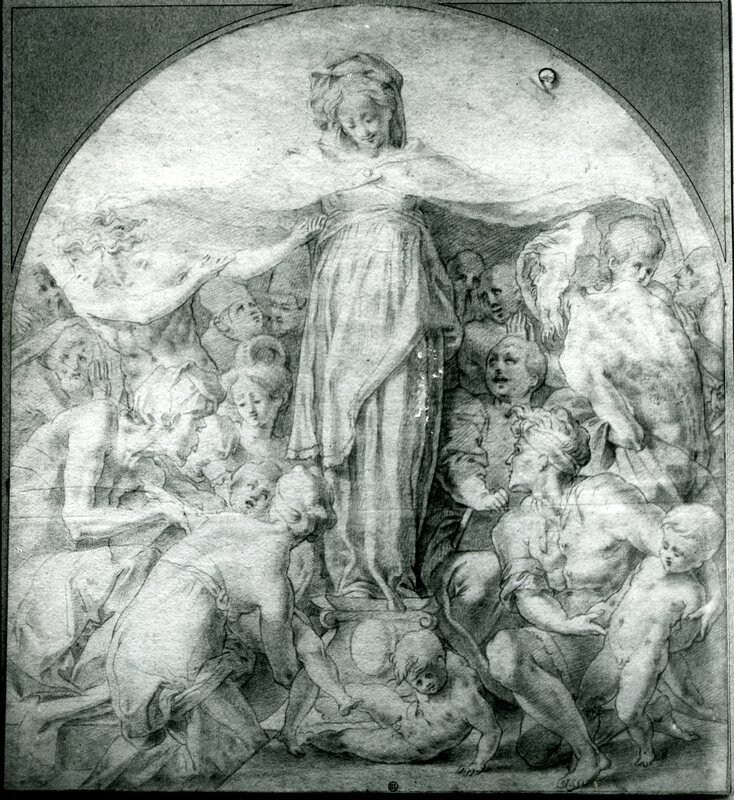 1579, giving Saint-Morys’ attribution to Primaticcio, and Morel d’Arleaux’s (4650) to the same artist. Carroll, 1987, 10, 25, 27, Fig. 4. Ciardi and Mugnaini, 1991, 150-151, 122, as Rosso. Franklin, 1994, 198, 227, 228, 255, Pl. 179, as by Rosso in his Aretine period and the drawing that was in Vasari’s collection, the old man and the mother and old woman who help the paralytic child borrowed from Rosso’s Throne of Solomon. Penny, 1994, 12, noted the bare breasts of the woman. 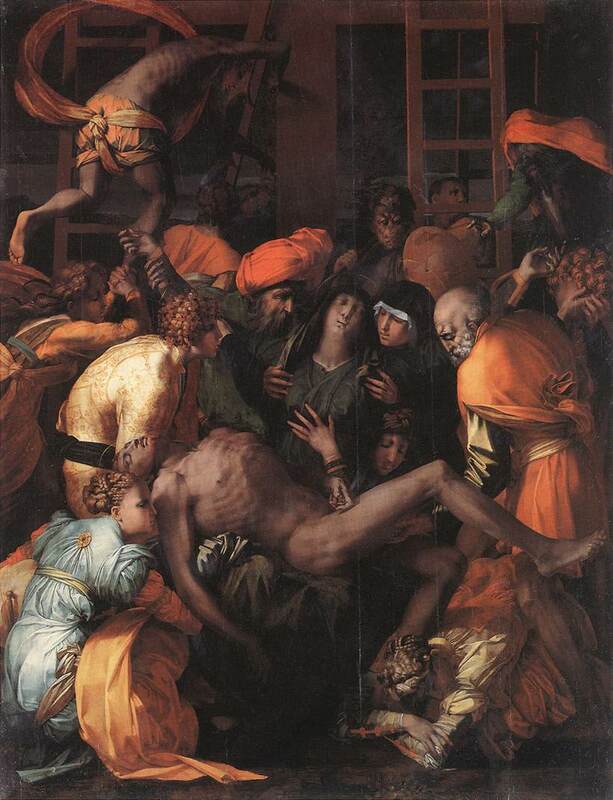 As according to Vasari this composition was never executed as a painting, the drawing in the Louvre, unless it is another unrecorded version of the same subject done by Rosso as a drawing in Arezzo, which is unlikely, must be either the drawing mentioned by Vasari or a copy of it. That it is an autograph work can easily be seen by comparing its draughtsmanship with that of the study of 1522 (Fig.D.7) for the figure of St. Sebastian in the Dei Altarpiece and with that of the four Gods in Niches of 1526 (Fig.D.17A; Fig.D.17B; Fig.D.17C; Fig.D.18a). All of these drawings show the same fine contours and very finely rendered shadows. 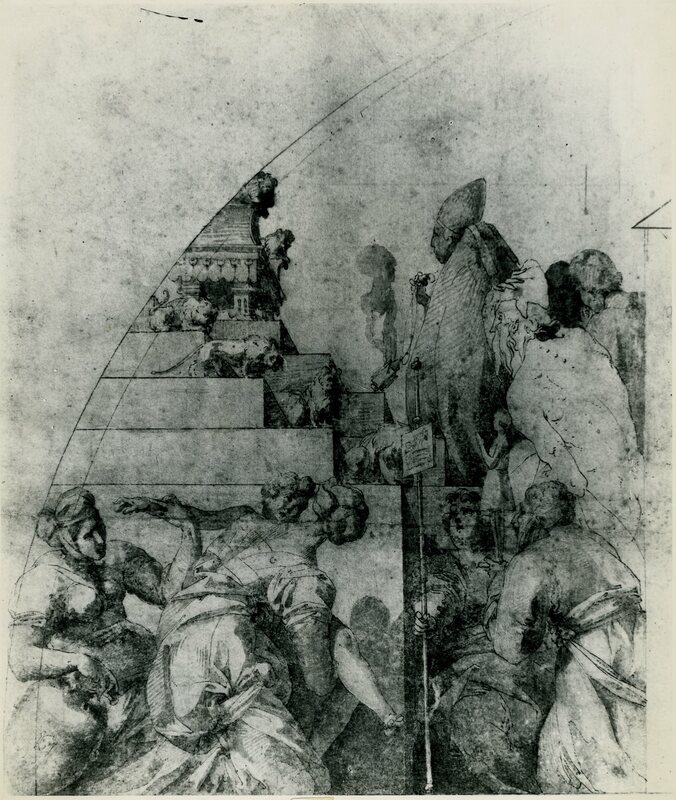 The Louvre drawing must be the drawing by Rosso that Vasari had in his Libro de’disegni.2 It is likely that it was done about the same time as the Throne of Solomon, in 1529. As the figures in the Louvre drawing appear more integrated in their composition than those in the Throne of Solomon, it is likely that the Madonna della Misericordia was invented first, and that some of its figures were then used again for the other scene. The conclusion reached by some that certain contours in the drawing have been gone over in black chalk by a later hand is not true. 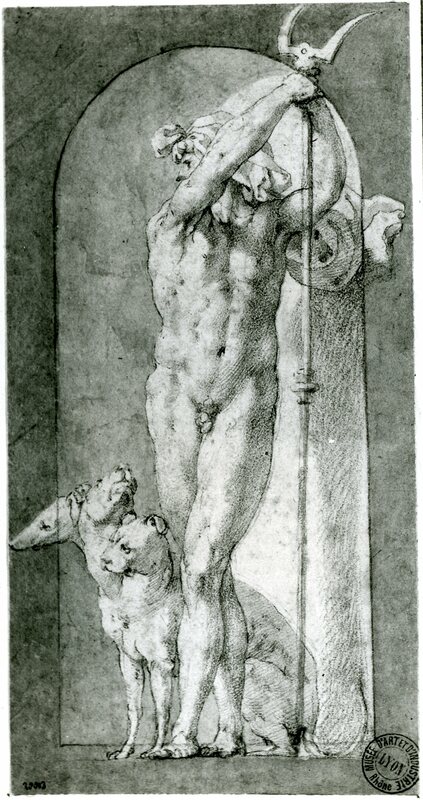 As appears in a number of Rosso’s red chalk drawings, such as those of 1526 for the Gods in Niches (see above), black chalk was used to lay down a very faint underdrawing from which the finished drawing was carefully worked up. There are also no signs that the contours have been gone over in red chalk. On the chapel that Rosso designed for his Madonna della Misericordia, see L.33. COPY: Paris, Louvre, RF 558 (Fig.D.35 Copy, Paris, color; Fig.D.35 Copy, Paris, bw). Red chalk; 29.8 x 26.8; laid down; wm?. The Virgin’s garment is abraded at the right and there is a hole at the upper right of the sheet. There are pin holes in the center of the drawing as in the original, possibly related to the making of the copy. PROVENANCE: His de la Salle. LITERATURE: Kusenberg, 1931, 150, no. 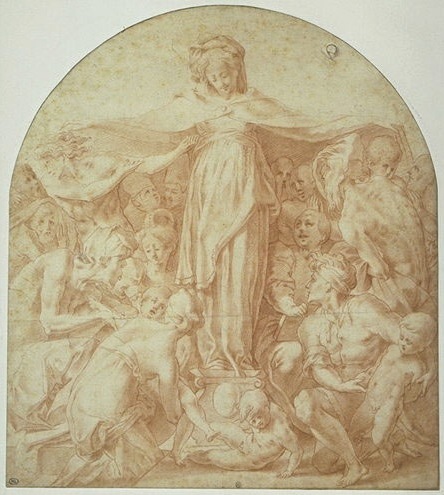 24, as a copy by Vasari of Rosso’s drawing. Adhémar, 1954, Pl. 17, mistakenly reproduced as the original. Carroll, 1964 (1976), II, Bk. II, 309, under D.31. Viatte, in Bacou 1968 (see above), under no. 42, as a copy of Rosso’s drawing. Ragghianti Collobi, 1974, I, 117, as by Vasari. Mercantini, 1980, 22, as by Vasari. C. Davis, in Giorgio Vasari, 1981, 273, under no. 31. Franklin, 1994, 294, n. 108. The attribution of this copy to Vasari, first made by Kusenberg, interesting as it is in relation to the fact that he owned the original drawing, is possible but not provable at the present time. 1 See Mercantini, 1980, 8, and Berti, 1961, 6, for the original name of the confraternity later called the Fraternita dei Laici. 2 Unfortunately, the provenance of the drawing is not known between the time that it is assumed to have been in Vasari’s collection and its entering the Louvre during the French Revolution (according to Viatte; see above). 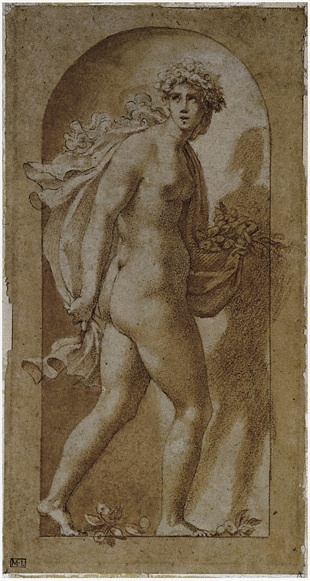 The drawing is not mounted in one of Vasari’s characteristic frames, but this does not necessarily mean that it was not in one of Vasari’s books of drawings from which many sheets were detached at one time or another. The fact that the largest group of drawings from Vasari’s collection is now in Paris lends some weight to the probability that the Louvre drawing comes from the same source (see Kurz, 1937, 4-6). 3 The costume of the Virgin and the grouping of the figures around her in Vasari’s Madonna della Misericordia, painted in 1557 for the baldachin of the Fraternita, suggest a relationship to Rosso’s drawing (see Mercantini, 1980, 14, 19, n. 29, 28, 57, 59, Fig. 27 and ns. 102-103, and Franklin, 1994, 294, n. 108). 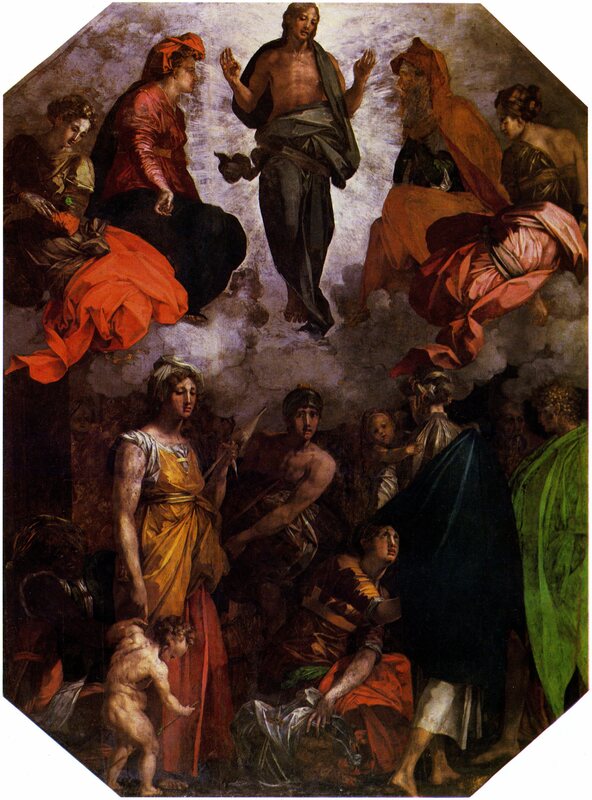 In the 1570s, the Fraternita had a chapel built in the Pieve in Arezzo – it is in a chapel behind this church that Rosso’s altarpiece, made from his drawing, would have been placed – perhaps designed by Vasari and built by Andrea Mazzolini, for which, in 1574, Barocci was commissioned to paint his Madonna del Popolo, finished in 1579 and now in the Uffizi (see Corrado Lazzeri, “La chiesa di S. Maria della Pieve prima dei restauri della seconda metà del secolo passato,” Arezzo e gli Aretini (edited by Ugo Viviani), Arezzo, 1921, 202, and Andrea Emiliani, in Mostra di Federico Barocci, Bologna, 1975, 112-118, no. 106). Some of the figures in the lower half of this painting suggest that Barocci may have known Rosso’s drawing.